：Produce parasols on the moon, and float into space.・・・The parasols are too heavy. ・The films(having a thickness of 0.005mm diametrically 60cm, and disposed diametrically 5,000km 100,000 km long cylindrical in Lagrange point) scatter sunlight 10%. ・The total weight of films is 20 million tons. The films are launched in electro magnetics-based launcher from the ground, and those are moved to the Lagrange point in the ion engine transport aircraft. ・・・The parasol is still heavy. ☆If you use panels as parasol, you can lead to cost down by linking to "Ｎｏ．６９−４　Space Solar Power Systems：SSPS". • In this plan they set up space-sprinkler at the Lagrangian point, and create parasol with sprayed dust and soot between the earth and sun. ・If you establish a space-sprinkler except Lagrangian poin, you should always have corrections to change the location. ・Lagrangian point is position where they can rotate around the sun without changing the positional relationship between the sun and the satellite, and there are five points between the sun and the earth. 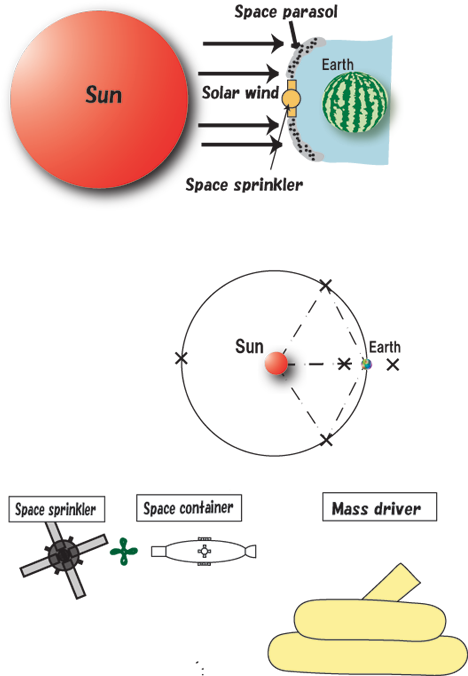 ・In the Space parasol plan, a space sprinkler and a space container are sent with a mass driver from a moon base to the Lagrangian point. ・A space sprinkler rotates at the Lagrangian point, sprinkling dust and soot, and "The Parasol" will be formed between the sun and the earths. ○The human race needs to move to Mars orbit to within 1 billion years. ・Arranging a huge pulse fusion rocket engine on the equator of the Earth, and moving the Earth to the Jupiter orbit. ・In this project Earth's mass is released 10% between 1 billion years. ・It uses the the same techniques to deflect asteroids or comets heading towards Earth to control the orbit of the Earth. ・We just require delicacy of planning and manoeuvring for avoiding an adverse influence on the Earth and the moon.